Camping is a dream of every outdoor lover. Driving along the Golden country side, enjoying the water mirroring the sky, camping in the middle of nowhere, pitching tents next to the lake, collecting wood for campfire, and spending the night amidst fulfilling natural setting can be an amazing experience. Such is the small pleasure that makes a soul happy and gives freedom from materialism. Pawna is an extremely huge and adorable lake near the popular hill station of Lonavala. There are many historical forts around like Lohagad, Visapur, Tikona, etc. to trek around. This is a CarvanTrips Select trip: A personalised Road Trip & Adventure experience which requires no minimum booking and no dependency on any group. A fun new way of discovering Hidden locations, Secret campsites, Adventure activities and unique experiences on your own, without the worry of uncertainties. Each of these destinations come highly recommended by our past travellers and Carvan Trips endorses these only after personally visiting there. 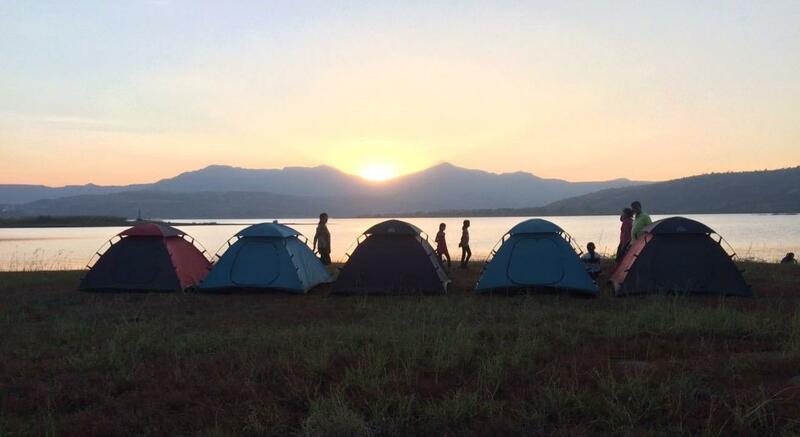 Reach the base village before sunset by 5pm and head to the lakeside for camping. Enjoy the sunsetand the surroundings. Later enjoy a Campfire(Create your own story telling, games, music andother fun activities around the fire). Have Dinner and Sleep early so that you can spend a little time around the lakeside next morning or maybe catch the sunrise. Sleeping blanket and mattress inside. Transport till the campsite and back and anything not mentioned in “includes”. Please refrain from consuming Alcohol or any intoxicant up till 24 hours before the trek as it may cause severe dehydration, nausea, vomiting and risk to life. Avoid carrying heavy weight backpack for this trek. Keep everything covered in a plastic bag as there can be chances of raining. The food provided would be simple village food. This is a budget nature trip. The facilities available at the campsite are minimal. The tents are simple but cozy, non-luxury tents. The food will be simple but tasty authentic village food. Since the campsite is at an eco-sensitive zone, permanent toilets are not available at the campsite but can be accessed at a walking distance. In case of any unexpected change in weather or other unforeseen situations that are beyond our control and due to which camping may not be feasible, the operator will try their best to make alternate stay arrangements in the nearby homestay OR village (subject to availability). In case it rains, campfire will not be possible. The itinerary is indicative only. A circumstantial delay can be expected on the day. Please make post trip plans after adding a buffer accordingly. Full/ Half sleeve T-shirt with stretchable Gym Pants/ Yoga/ Track pants/ Shorts. Please DO NOT WEAR Denims or formals. Good Quality Trekking/ Hiking shoes Compulsory (Floaters and Sandals are not allowed) or a comfortable pair of sport shoes with a good grip. Please don’t wear formal/ casual/ leather shoes and please ensure the shoes are of good quality and not old as to avoid wear & tear especially of the shoe sole. A light pair of slippers in the bag (for post trek).